It took a few months longer than its 256 GB compact flash card, but Lexar has finally announced a matching 256 GB SDXC card that makes it oh-so-easy to lose or misplace a quarter terabyte of photographs. To put that in perspective, if you were shooting full resolution, full quality JPGs with the Sony RX100, you'd be able to snap just under 80,000 shots before needing to swap out your card. While Philips is backing out of the ultrawidescreen game, it appears Vizio is still trying to move at least a few more units. The company announced that its 58-inch CinemaWide HDTVs have moved from being available exclusively online, to the physical store shelves of Costco and Sam's Club stores. If the prospect of watching most movies without any black bars (although standard 16x9 TV programming won't quite fit without side bars, zooming or app/menu filler) hasn't quite moved you to buy, there is also the news that its price has dropped another $500 to a shade below $2,000, which puts it closer to the 46-inch HDTVs it's size resembles when watching regular widescreen video. When they initially started shipping our friends at HD Guru were told it was a limited one time only run of 1,000 units -- we'll see if any more sets show up or if this the last gasp for HDTVs in this format. 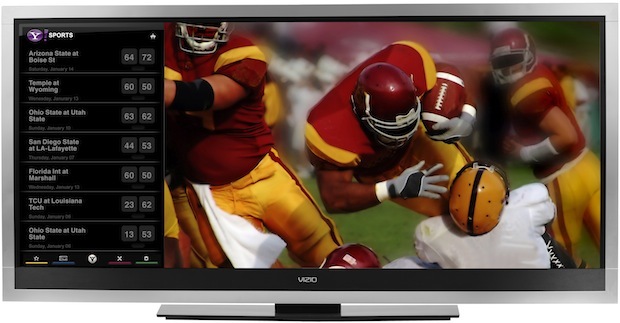 Vizio's CinemaWide 21:9 HDTVs hit physical store shelves, price slides below $2k originally appeared on Engadget on Fri, 21 Sep 2012 13:35:00 EDT. Please see our terms for use of feeds. Great news for those waiting anxiously at the door for their UPS / FedEx delivery... well, for those awaiting a Verizon iPhone 5, anyway. 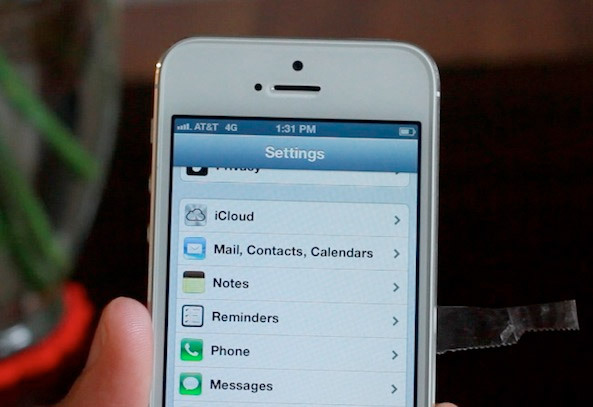 We've already broken down the differences between the trifecta of iPhone 5 models, and it seems that the one VZW is hawking is a real gem for travelers. Aside from handling Verizon's LTE waves just fine, the nano-SIM slot will also accept cards from any other GSM carrier worldwide. In other words, AT&T nano-SIMs will get you onto its HSPA+ network, and T-Mobile nano-SIMs will play nice as well. If you're heading overseas, you can pick up a local nano-SIM on arrival and plug it straight in -- no unlocking code necessary. To confirm, this even applies to Verizon iPhone 5 units that were purchased under contract. You can hit the video after the break for proof, but heed one word of advice: wait until you find a legitimate nano-SIM to throw in there. It looks as if the cut-and-stuff approach leaves a bit to be desired. Verizon iPhone 5 is unlock! ed, able to accept GSM SIMs right away originally appeared on Engadget on Fri, 21 Sep 2012 16:23:00 EDT. Please see our terms for use of feeds. It's always just been a matter of "when" and "how much," but it looks as if PC gamers looking to score a powerplant upgrade can start planning on specific amounts. AMD's impending FX Piledriver CPUs are now up for pre-order at ShopBLT, an outlet that has proven reliable in the past when it comes to nailing down processor pricing. For those in need of a refresher, these are built using the Vishera design, with the range including between four and eight CPU cores. We're expecting 'em to best the Bulldozer family, and if all goes well, they could be available to the earliest of adopters in October. Presently, the FX-4300 ($131.62), FX-6300 ($175.77), FX-8320 ($242.05) and FX-8350 ($253.06) are listed, but CPU World seems to think launch day quotes will actually be a bit lower. Only one way to find out, right? AMD Piledriver CPU pre-order pricing leaks out originally appeared on Engadget on Fri, 21 Sep 2012 18:41:00 EDT. Please see our terms for use of feeds. Windows/Mac and iOS: Need a bit of extra screen real estate? 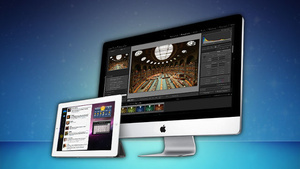 iDisplay can turn your iPad into a second monitor for your Mac or Windows PC, and it's on sale for $1.99 right now. iDisplay, usually $5, is a cheap, easy way to extend your desktop onto your tablet. $5 can sometimes seem like a hefty price, especially when you can't test an app out first, so it's great that iDisplay is on sale for $1.99 in the App Store. Unfortunately, the Android version is still full price, but if you're armed with an iPad, head over to the App Store and grab your discounted copy while you can. Last month, Samsung showed us a glimpse of its Galaxy Camera: A weird and wonderful mashup of the Samsung Galaxy S III and a long-zoom point-and-shoot. Now, we've finally seen one of the first on American soil. 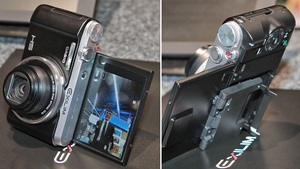 Oh please, Samsung figure out how to bring this camera to America. Even though what you're looking at above is just a prototype, the camera works far better than you'd expect from a Frankensteinish combination. It's running the silky Jelly Bean OS over the same core specs as the Galaxy S III: the same 4.8-inch LCD touchscreen, the same 1.5 GHz quad-core processor. The addition of a 1/2.3-inch image sensor and a 21x optical zoom doesn't slow the camera down at all. The pictures we saw taken with the camera looked sharp and beautiful, and the full-manual camera controls built for the touchscreen interface are very well designed. Overall, we're impressed at what Samsung built, but the only problem is that we've got no idea when we might actually see this camera for sale in the United States. Samsung wants to bundle it with a data plan so that you can instantly share your photos to Instagram and Facebook, or upload them to your favorite storage locker service. So far, there's no US carrier on board for the camera. Pricing for a data plan will be tricky. But based on what we've seen, the sooner they figure it out the better. We can't guarantee what this box contains, but if the list of specs is accurate then it's definitely too good to gift-wrap. The photo above was posted to a Chinese forum thread entitled "Padfone 2 specs revealed" by a user called cj1024, and indeed the A68 model number at the top of the list does sound appropriate, considering the original Padfone was the A66. If we assume it's legit, for the sake of argument, then maybe we can expect ASUS's next modular phone to come with the same quad-core Snapdragon S4 Pro processor and 13-megapixel camera resolution that are already strutting around in the LG Optimus G, alongside an uncommonly bright, 4.7-inch 1280 x 720 Super IPS+ display, LTE and 2GB of RAM. You can digest the rest for yourself, or just wait until October 16th. Update: Keen-eyed doubter Firuz has spotted a problem: the display icon says "SuperAMOLED" even though the specs state "Super IPS." Dodgy 'chop or actual packaging error? You decide. 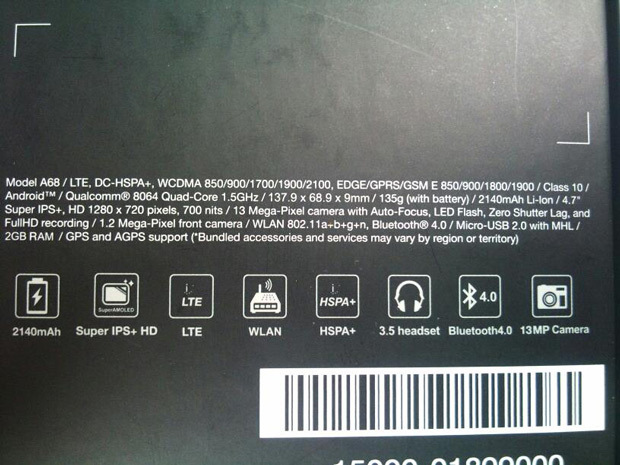 Packaging hints at ASUS Padfone 2 having 4.7-inch 720p display, 13MP camera, quad-core S4 Pro originally appeared on Engadget on Fri, 21 Sep 2012 06:! 21:00 ED T. Please see our terms for use of feeds. Qualcomm's Vellamo app has been a part of the furniture in our Android benchmarking suite for a while now, providing a fun little test of browsing and networking speeds on almost any Android device. Version 2.0 adds something extra, however: a section called "Metal" that is all about putting your processor and memory through the wringer. As a quick taster, we ran the new HTML5 and Metal tests on the HTC One X (both global and AT&T) and the Galaxy S III (global and Sprint), settling on the average of three consecutive results. Conspiracy theorists who think that Qualcomm's app favors its own processors will only find further ammunition in the CPU results, however the HTML5 scores actually give the QCOM devices much less of a lead than the old Vellamo did, scoring all four handsets roughly equally. You'll find the table overleaf, along with a publicity video that explains the update. 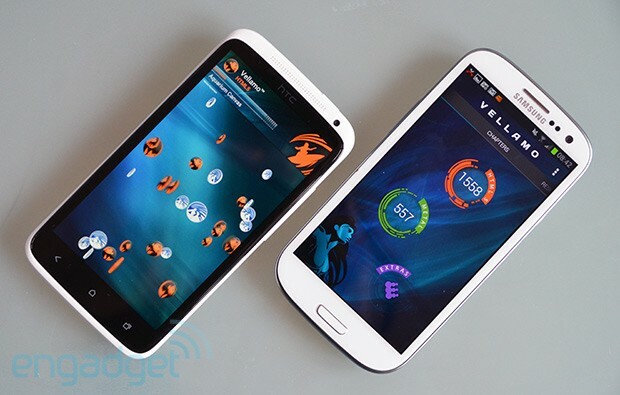 Vellamo benchmark adds CPU and memory tests, here's how it rates the One X and GS III originally appeared on Engadget on Fri, 21 Sep 2012 06:3! 1:00 EDT . Please see our terms for use of feeds. All we know so far is that it's possibly coming to US shores at some point in November, but the good news is that Sprint brought along one of the world's most famous phablets to a press event in New York City and, better yet, we got to play with it for a little while. 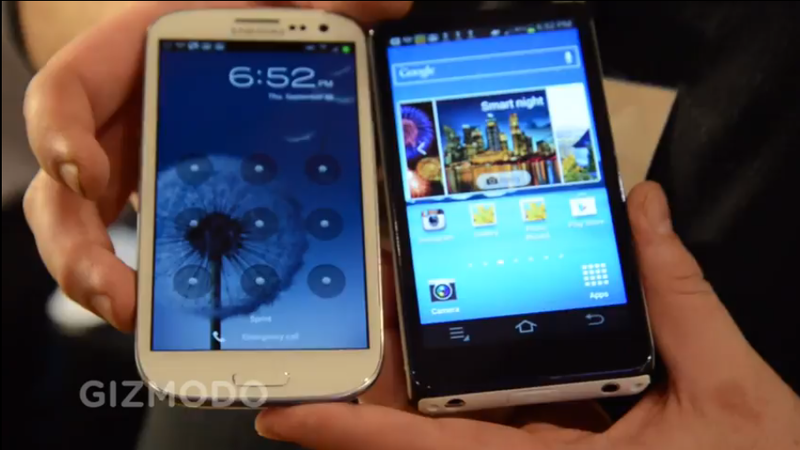 Yes, we're talking about the Galaxy Note II. Looks-wise, the Now Network's flavor of that 5.5-inch behemoth hasn't exactly changed much from the unit(s) we landed our hands on when it was first unveiled to the world, meaning there's no "Sprint" branding anywhere to on the plastic shell -- at least for now, and, frankly, we kind of hope it stays this way. With that being out of the picture, the oversized handset looked as shiny as ever in its Marble White attire, which is the only color Sprint was happily showing off for the night. And while this particular Jelly Bean-loaded Note II was capable of running on the carrier's new LTE network, we weren't able to test out out data speeds due to matters out of our reach. On the software side of things, we didn't notice any major hiccups worth pointing out, with the experience being rather similar to the one during our first encounter with Sammy's second-gen Note -- or, in other words, it felt very, very snappy and overall great. That said, the carrier, as! it did with the Galaxy S III, looks to be pre-loading the device with some of its own applications, including ones such as Sprint Zone and other third-party apps like Polaris Office 4. Naturally, we popped the obvious question to Sprint of when we could expect the device to legitimately become part of its lineup, to which the carrier told us that it'd be sometime "this holiday season." For now, it looks like the hands-on gallery below will have to suffice, but you can be sure we'll let you know as soon as we find out the official release date. 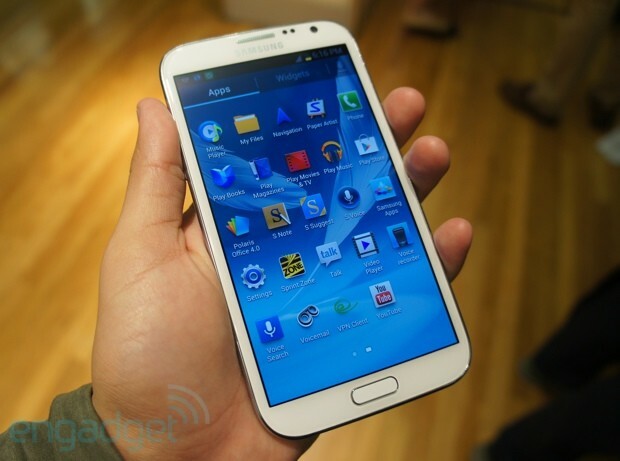 Samsung Galaxy Note II for Sprint hands-on originally appeared on Engadget on Thu, 20 Sep 2012 20:28:00 EDT. Please see our terms for use of feeds. 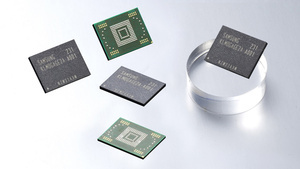 There might just be a 128GB memory option when it comes to upgrading to the Galaxy S4 next year or the S5 the year after, thanks to Samsung now mass producing 128GB memory chips for use in mobile devices. 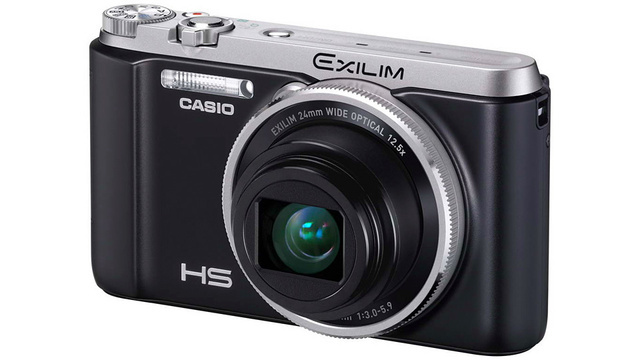 Casio's not always the first name you think of when you're shopping for a digital camera, but occasionally the company comes up with a neat feature that might have you reconsidering that Nikon or Canon. Such is the case with its new Exilim EX-ZR1000, which makes it extra easy with not only a flip around LCD display, but also a built-in stand keeping it propped up in either portrait or landscape modes. The $450 16.1-megapixel shooter has a few other neat tricks up its sleeve too, like a motion activated shutter release that lets you trigger a two second countdown by simply waving at the camera, and a dedicated mode dial that's rare on a point and shoot. It's also got a decent 12.5x optical zoom, and instead of a lever located around the shutter release, zooming is controlled via a ring around the lens barrel letting you easily zoom in and out while snapping away. If you've been looking for a better way to snap profile pics for Facebook or Twitter and don't mind a little overkill you'll be able to get your hands on the Exilim EX-ZR1000 come November. The Huawei Ascend G600 is expected to arrive in Europe sometime this month, but in the meantime, the middle-weight smartphone was recently spotted at the FCC, where it revealed... well, not much. We're able to determine from the test reports that this is, indeed, the handset bound for Europe, as its UMTS / HSPA (3G) capabilities will be limited to the 2100MHz and 900MHz bands. Meanwhile, here in the States, the phone will be limited to EDGE connectivity. The Bluetooth and WiFi components also received a stamp of approval from the FCC, although the inclusion of these components should be a surprise to none. Beyond its connectivity, the Ascend G600 will combine Android 4.0.4 with a dual-core 1.2GHz CPU, a 4.5-inch qHD display and will sell for €300 ($390) whenever it actually hits store shelves. 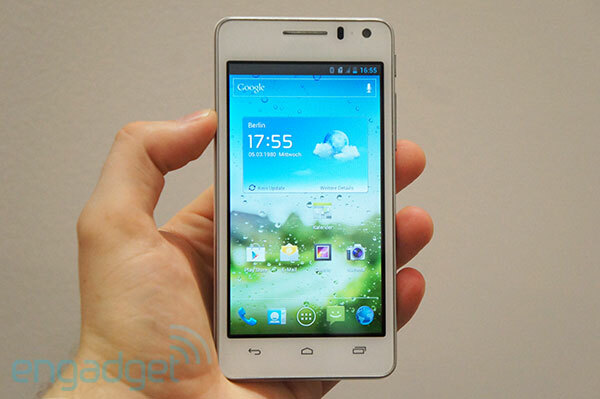 Huawei Ascend G600 survives FCC interrogation originally appeared on Engadget on Thu, 20 Sep 2012 07:29:00 EDT. Please see our terms for use of feeds. 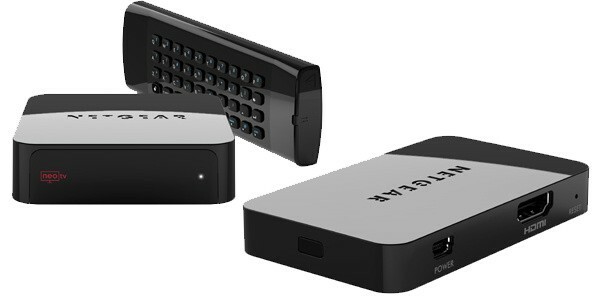 Today, Netgear is unveiling three more Roku-troubling NeoTV boxes and Push2TV, a wireless display adapter letting you harness WiDi or Miracast to push content from smartphones, laptops or tablets to your TV. The trio of NeoTVs are so similar to the last generation that it's a little hard to tell the difference, except that the new flagship NeoTV MAX now comes with the long-desired addition of DLNA and a custom remote that has navigation buttons on one side and a QWERTY keyboard on the other. All four devices are available from today, the Push2Tv costing $60, while the new NeoTVs are priced at $50, $60 and $70, respectively -- and if you'd like to know more, then we've got some more info down below. Netgear announces Push2TV WiDi adapter and three new NeoTV units originally appeared on Engadget on Thu, 20 Sep 2012 08:30:00 EDT. Please see our terms for use of feeds. Virtual machines are great for running another operating system on top of your desktop, like testing out Windows 8 or running OS X inside Windows. 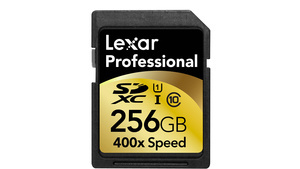 They can be notoriously slow, though, and using a fixed size disk can help you speed things up. Our friends over at the How-To Geek round up a bunch of tips for speeding up your virtual machines. Some you may already know, like allocating more RAM or CPU resources to the system, while others you might not. Here's one we didn't know about: using a fixed size disk can actually make your machine run faster than using the space-saving, dynamically allocated disk—particularly when you're writing large amounts of data to your virtual machine (big file transfers, downloads, and so on). It'll also decrease the amount of fragmentation your disk experiences. 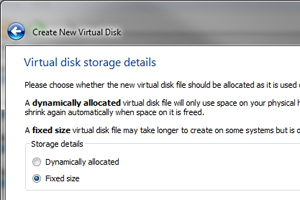 To use a fixed size disk, just choose the option when prompted during the initial setup of your machine. The How-To Geek has all sorts of other performance-boosting tips in their guide, from placing VMs on another drive to excluding those files from antivirus apps. Hit the link below for the full guide. While Google Maps may have found itself on the outside looking in on the just-released iOS 6, it's got a fresh update for Android devices that makes sure any locations you've searched are right at your fingertips. Rolling out now in Google Play, it includes results from your search and directions history (whether on your phone or on a PC that you were logged in to) whenever you start a new search, and in the search or directions tab under My Places. The other tweak noted in the changelog is the ability to zoom with just one finger -- double tap the map then hold down your finger and slide. There's no word specifically on what's in store for Apple's hardware but the final line of the blog post mentions improving the Google Maps experience across all devices -- draw your own conclusions from that. Google Maps for Android update brings your full location search history to handhelds originally appea! red on < a href="http://www.engadget.com">Engadget on Wed, 19 Sep 2012 18:12:00 EDT. Please see our terms for use of feeds. Boost Mobile has a history of recycling Sprint's smartphones, but every now and then it releases a first-run phone of its own. This time around we're looking at the ZTE Warp Sequent, a fitting follow-up to last year's ZTE Warp. Packed to capacity with entry-level goodness, the Warp Sequent features a 4.3-inch qHD display, a 1.4GHz processor, a 5-megapixel rear-facing camera, a 1.3-megapixel front shooter, 768MB of RAM, 4GB of internal storage and Android 4.0. So, if you've got a serious hankering for an off-contract Android running last year's operating system, the ZTE Warp Sequent can be yours for $200. 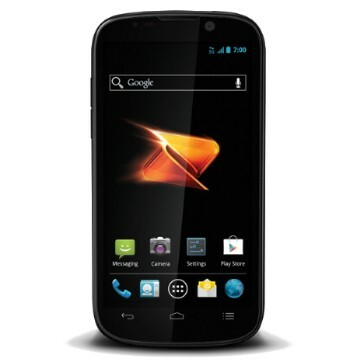 ZTE Warp Sequent now available on Boost Mobile for $200 originally appeared on Engadget on Wed, 19 Sep 2012 21:06:00 EDT. Please see our terms for use of feeds. It wouldn't be a seasonal HP product launch without dozens of PCs and at least one monitor, right? This go-round, the company is launching the x2401, a 24-inch, 1080p display with a slim, 11mm-thick frame. Though the last two monitors we saw from HP were IPS, this one makes use of MVA technology to help ensure wide viewing angles. If you're looking to add a display to your setup, this one has a DisplayPort socket and HDMI-in. (You can also mount it to the wall, if that's your bag.) Expect it to arrive on November 7th for $249. Additionally, HP will sell a business-oriented version, the L2401x, the main difference being that the commercial version has a three-year warranty, instead of one. Not bad, considering the business version costs only ten bucks more. HP's 24-inch x2401 monitor is just 11mm thick, arrives in November for $249 originally appeared on Engadget on Thu, 20 Sep 2012 00:01:00 EDT. Please see our terms for use of feeds. Remember the Pavilion m6? 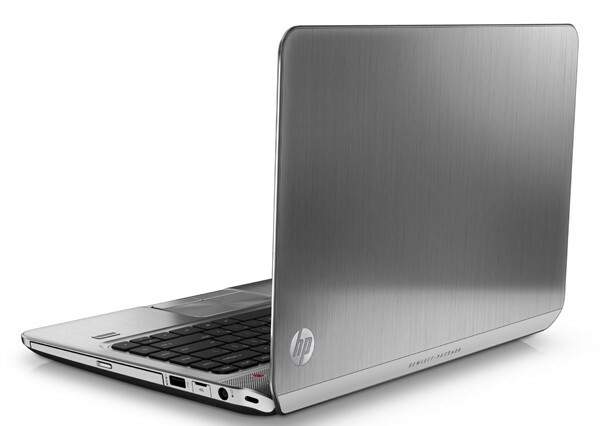 It was one of many, many lightweight laptops HP announced last spring. To recap, it didn't technically fit Intel's Ultrabook specifications, but it was still quite thin, and offered features not normally found on ultraportables -- things like discrete graphics and a subwoofer. In any case, HP is expanding that particular line: it just announced the Envy m4, a 14-inch companion to the 15-inch m6 that went on sale this summer. Like the m6, it has an aluminum design, along with Beats Audio and a subwoofer. Spec-wise, it'll be offered with Core i3 and i5 processors, up to 8GB of RAM and either a solid-state drive or up to 1TB of HDD storage. The display resolution is fixed at 1,366 x 768 -- typical for mid-range laptops. (Note: only one configuration will be available in the US, though additional variants will be offered in other countries.) Intel Wireless Display is standard, and the battery promises up to eight hours of runtime. 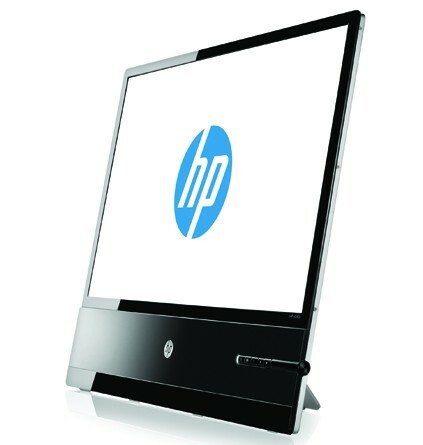 It also has a fingerprint reader, which you can use with HP's SimplePass technology to log into the PC and as well as websites. Meanwhile, HP added two models to its growing line of Sleekbooks (read: thin-and-light laptops that for whatever reason don't meet Intel's Ultrabook requirements). These new models include the Pavilion Sleekbook 1! 4 and 15 , which look like the company's entry-level G series, but are significantly trimmer. The laptops, available in black and red, will be offered with Ivy Bridge chips, optional discrete graphics, 1080p displays, up to 8GB of RAM and up to 1TB of HDD storage. In both cases, the battery life is said to max out at six hours -- less than the m4 or most Ultrabooks, but still decent. Last thing -- and this really is apropos of nothing -- HP also mentioned in its press release that the existing 11-inch Pavilion dm1 will be offered with an HSPA+ radio capable of running on T-Mobile's network. HP says it will offer up to 200MB of free data per month, for two years. That deal is effective next month, on October 26th. The Envy m4 will start at $900 while the Pavilion Sleekbook 14 and 15 will go for $500 and $560, respectively. These, too, will arrive on the 26th, the day Windows 8 launches. For now help yourself to photos galore past the break. HP announces Envy m4 thin-and-light, along with two slimmed-down Sleekbooks originally appeared on Engadget on Thu, 20 Sep 2012 00:01:00 EDT. Please see our terms for use of feeds. 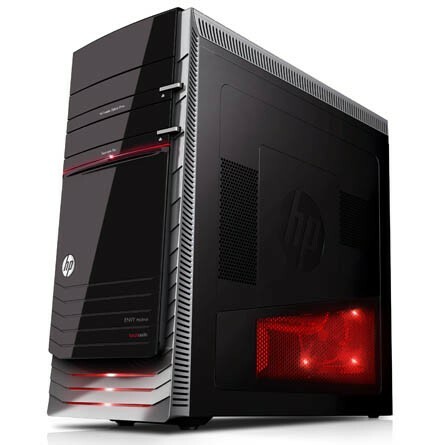 It was just a few months ago that HP refreshed its Envy Phoenix h9 desktop tower with Ivy Bridge processors, and now it's gone back to the drawing board to re-tool the design itself. In its latest incarnation, it has an "armor-plated" design and toolless hard disk bays that can support up to three drives. HP says it also fine-tuned the cable dressing to improve airflow and cooling performance. As ever, the machine will be offered with third-generation Intel Core processors and your choice of NVIDIA or AMD graphics. Solid-state drives are also an option. Curious? You'll have to wait until the Windows 8 launch on October 28th to get one. An odd move, if you ask us, since the h9 isn't a Win 8-optimized system, and the changes here appear to be purely hardware-related. HP retools its Envy Phoenix h9 desktop, says the new version will go on sale October 26th originally appeared on Engadget on Thu, 20 Sep 2012 00:01:00 EDT. Please see our terms for use of feeds. Between big guns like GoPro and Contour and big names like Sony, the action camera market is getting pretty full, pretty fast. Back in May, we saw the arrival of the Air Pro WiFi from Ion, an oblong mountable camera with an add-on WiFi module, and now the company's got another addition to the line, the punnily-named (wait for it) Ion The Game (get it? Eye? Eye-on The Game?). The whole "action" part is far less pronounced here. This sports cam is intended to be more stationary than its predecessor -- mounted on a still spot to capture soccer games (don't let them catch you calling it that here in Europe) and to help you critique your golf swing. The key differences here -- aside from its boxier shape -- are the 2.5-inch display and the WiFi, which is built directly into the device, rather than relying on an add-on. The display isn't much to write home about. It's small, a bit dull in the color department and a little choppy. 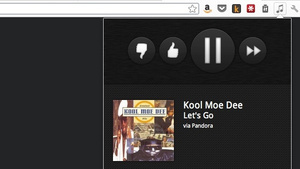 It'll get the job done though, when it comes to monitoring action (or lack of action, we guess) on the fly. The WiFi meanwhile, adheres to the company's whole "shoot-and-share" motto, letting to send videos directly to Facebook and the like. The camera looks reasonably rugged, with a plastic protected lens -- it's also water-resistant up to 10 meters. The Game records to SD cards and will be arriving by the end of the year, priced at an admittedly lofty €329 here in Europe. 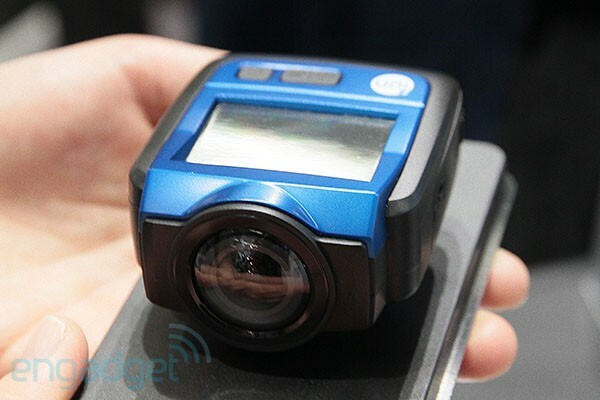 Ion The Game action cam has built-in WiFi and 2.5-inch display, we go hands-on originally appeared on Engadget on Thu, 20 Sep 2012 03:00:00 EDT. Please see our terms for use of feeds.